If World War I was a static war, then World War II was a war of mobility. ‘This is a war of engines and octanes,’ Stalin said while toasting the US automotive and petroleum industries. Hitler was known to rant for hours about oil and some say designed his grand strategy around the capture of oil fields—first in Romania, then those surrounding Baku. Other historians see the Japanese attack on Pearl Harbour as a means to seal off a perimetre for its capture of the resource-rich ‘South Zone’ (China and Southeast Asia), the oil-rich Dutch East Indies most importantly. At the outbreak of WWII, no country came close to producing—or consuming—as much oil as the United States. In 1940, the country produced 3.7m barrels per day (bpd), thanks in part to the discoveries and development of giant oil fields in the southwestern US: Signal Hill (California, 1921), Greater Seminole (Oklahoma, 1926-7) and others, the Yates field (west Texas, 1926) and finally the ‘Black Giant’ (east Texas, 1930-1), to name only the largest. As Lord Curzon said of WWI, ‘the Allied cause had floated to victory upon a wave of oil’. In WWII, it would need to do so again, but on a much larger scale and again using oil from American fields. (In WWII, US forces in Europe alone would use 100 times more gasoline than in WWI). Coordinating this global supply effort was a major challenge—and source of serious stress as to which theater got prioritized. Crude oil was pumped from these American southwestern states, refined and moved to the northeast by ship or tank. It’s at this point that things got dangerous. Here we focus on the long drawn-out devastation of the Battle of the Atlantic. With all parties critically aware of oil’s strategic importance, oil transport became a focal point of war. And since this was a global war, this transport invariably took place at sea. The outbreak of war in Europe in late 1939 spread to the vast north Atlantic where, till about mid-1943, the Germans did their best to choke off Britain from American shipments of vital supplies. German submarines, the infamous ‘U-boats’ that operated in ‘wolf packs’, wreaked havoc on US supplies. Led by Admiral Karl Doenitz, the German submarine force operated under his motto: ‘Rescue no one and take no one with you’. No target was more appealing for them than Europe-bound oil tankers. (The American Navy was doing the same to Japan-bound oil tankers in the south Pacific). By March 1941, with oil supplies in Britain at dangerously low levels, Churchill called the submarine campaign ‘the blackest cloud which we had to face’. He knew the importance of oil. After all, this was the man who spearheaded the political fight to convert the Royal Navy from coal to oil. And he’d seen firsthand how certain types of oil—100-octane aviation gasoline in particular—gave the Spitfires greater speed, power and maneuverability against the Messerschmitt 109s, running on the less powerful 87-octane gasoline, to fend off the German invasion during the ‘darkest hours’, the Battle of Britain in 1940. Churchill knew Britain couldn’t survive the war without American help—American oil included. And Doenitz and his U-boat wolf packs knew that too. In July 1941, Britain had only five weeks of motor gasoline stocks and only two months of fuel for the Royal Navy, so effective were the U-boats at attacking the long and vulnerable supply chain between the US and Britain. For its part, the US was wholly unprepared to counter the submarine threat. It scrambled to devise only partially effective measures, such an increasing its patrols and establishing bases in Bermuda, Greenland, Iceland and Newfoundland. Around this time, the British managed to crack the German naval codes, which allowed them to send their convoys along open routes. ‘It was only by the narrowest margins,’ one British intelligence historian wrote, ‘that the U-boat campaign failed to be decisive during 1941’. But it wasn’t over yet. Four days after the attack on Pearl Harbour, Germany declared war on the United States (11 December 1941). U-boats instantly pushed into American waters, again hunting their favourite targets: oil tankers. In the first three months of 1942, the number of tankers sunk was almost four times the number built. U-boats now infested the entire east coast, operating as they wished and with devastating results. The threat of an oil shortage was again consuming British strategists. In late April 1942, Harold Ickes, oil czar for the American war effort, warned President Franklin Roosevelt: ‘The situation is desperate’. The US again seemed unprepared to deal with the threat, instead instructing its tankers and other ships to stay close to the coast or take inland canals. Here is where big coastal cities quite literally shone the light on the targets (Miami had six miles of neon-lit beachfront), turning the silhouetted tankers into easy targets for the submarines. There was another alternative to get oil from the southwest to the east coast: to minimize the amount of oil shipped by tanker altogether. This meant the construction of a pipeline that defied anything done before it—in scale, size, and distance. Three factors made these engineering and scientific questions secondary: first, a pipeline pumping oil at about 5 miles per hour was admittedly slow, but it was way safer than tankers—as the Americans had learned the hard way; and second, shipping oil by pipeline was far cheaper than doing so by rail tank cars; and third, this was war and the Allied oil supply question couldn’t be left to chance. The ambitious pipeline scheme wasn’t new; it had been rejected in 1941 because of its enormous steel demands. But the oil transport question had become more pressing through 1942. So, construction began in August 1942 on what was nicknamed ‘Big Inch’, a project of extraordinary engineering during WWII, a pipeline that would stretch about halfway across the United States, from the Texas oil fields to the East Coast—1,254 miles (about 2,020 km)—and would carry five times the amount of oil as conventional pipelines. ‘Big Inch’ enlisted all an array of oil transport and construction industries, to say nothing of the equipment, to get it completed. At the end of 1943, after about a year-and-a-half after its start, the mega-pipeline was carrying almost half of all crude oil to the East Coast. 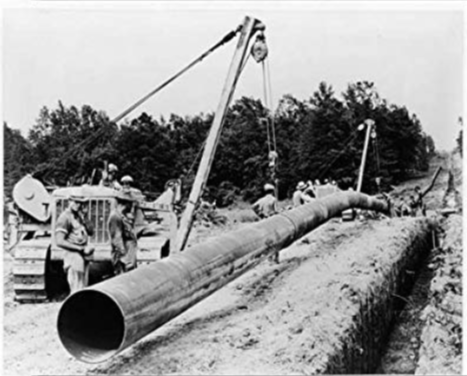 Another pipeline, dubbed ‘Little Inch’, was actually even longer (1,475 miles or nearly 2,400 km) was built between April 1943 and March 1944, to carry refined products, gasoline included, from the southwest to the east coast. By the end of 1944, these mega-pipelines together carried about 42% of all oil to the East Coast, versus barely 4% at the start of 1942. It wasn’t until the end of March 1943 when the power balance in the north Atlantic shifted decisively. The Allies had deciphered the new U-boat codes, while successfully closing off their own convoy codes from the Germans. Helping this reversal of fortune, the British and Americans improved their radar, introduced newly developed long-range aircraft (again, 100-octane aviation gasoline was crucial—something the Axis desperately lacked) and so could provide some air cover over previously ‘dark’ parts of the Atlantic. In May 1943, some 30% of U-boats were sunk. Doenitz, the commander who had for years stymied the Allied war effort in the north Atlantic, reported to Hitler: ‘We are facing the greatest crisis in submarine warfare.’ On 24 May, he ordered the U-boats to withdraw to safer areas, effectively ending the submarine campaign in the north Atlantic. Allied cargos of artillery, troops and of course oil, originating in the US, could now cross the Atlantic with the reasonable expectation of making it to their source. Oil from America’s southeast, having likely traveled through either ‘Big’ or ‘Little Inch’, was then transported across the Atlantic, to delivered either to storage tanks at air bases in Britain, into 5-gallon ‘jerrycans’, which were then shipped to the frontlines, or into tank cars at Soviets ports on the Barents Sea. While Rommel ran out of gas in north Africa and Japanese warplanes were grounded for lack of fuel (and so turned to the fuel-saving strategy of kamikaze), the United States never experienced a serious supply crisis during the war, increased oil production from 3.7m bpd in 1940 to 4.7bpd m in 1945, and consumed along with its Allied partners almost 7 billion barrels of oil—6 of which came from the United States. These pipelines were two impressive innovations among many during WWII, and ones that helped turn the tide in the Allies’ favour.